Profiling and benchmarking · Advanced R.
Find the biggest bottleneck (the slowest part of your code). Try to eliminate it (you may not succeed but that’s ok). This sounds easy, but it’s not. Even experienced programmers have a hard time identifying bottlenecks in their code. Instead of relying on your intuition, you should profile your code: use realistic inputs and measure the run-time of each individual operation. Only once you’ve identified the most important bottlenecks can you attempt to eliminate them. It’s difficult to provide general advice on improving performance, but I try my best with six techniques that can be applied in many situations. I’ll also suggest a general strategy for performance optimisation that helps ensure that your faster code will still be correct code. It’s easy to get caught up in trying to remove all bottlenecks. Don’t! Your time is valuable and is better spent analysing your data, not eliminating possible inefficiencies in your code. Be pragmatic: don’t spend hours of your time to save seconds of computer time. To enforce this advice, you should set a goal time for your code and optimise only up to that goal. This means you will not eliminate all bottlenecks. Some you will not get to because you’ve met your goal. Others you may need to pass over and accept either because there is no quick and easy solution or because the code is already well optimised and no significant improvement is possible. Accept these possibilities and move on to the next candidate. Measuring performance describes how to find the bottlenecks in your code using line profiling. Improving performance outlines seven general strategies for improving the performance of your code. Code organisation teaches you how to organise your code to make optimisation as easy, and bug free, as possible. Already solved reminds you to look for existing solutions. Do as little as possible emphasises the importance of being lazy: often the easiest way to make a function faster is to let it to do less work. Vectorise concisely defines vectorisation, and shows you how to make the most of built-in functions. Avoid copies discusses the performance perils of copying data. Byte code compilation shows you how to take advantage of R’s byte code compiler. Case study: t-test pulls all the pieces together into a case study showing how to speed up repeated t-tests by ~1000x. Parallelise teaches you how to use parallelisation to spread computation across all the cores in your computer. Other techniques finishes the chapter with pointers to more resources that will help you write fast code. If we profiled the execution of f(), stopping the execution of code every 0.1 s, we’d see a profile like below. Each line represents one “tick” of the profiler (0.1 s in this case), and function calls are nested with >. It shows that the code spends 0.1 s running f(), then 0.2 s running g(), then 0.1 s running h(). If we actually profile f(), using the code below, we’re unlikely to get such a clear result. That’s because profiling is hard to do accurately without slowing your code down by many orders of magnitude. The compromise that RProf() makes, sampling, only has minimal impact on the overall performance, but is fundamentally stochastic. There’s some variability in both the accuracy of the timer and in the time taken by each operation, so each time you profile you’ll get a slightly different answer. Fortunately, pinpoint accuracy is not needed to identify the slowest parts of your code. Rather than focussing on individual calls, we’ll visualise aggregates using the lineprof package. There are a number of other options, like summaryRprof(), the proftools package, and the profr package, but these tools are beyond the scope of this book. I wrote the lineprof package as a simpler way to visualise profiling data. As the name suggests, the fundamental unit of analysis in lineprof() is a line of code. This makes lineprof less precise than the alternatives (because a line of code can contain multiple function calls), but it’s easier to understand the context. To use lineprof, we first save the code in a file and source() it. 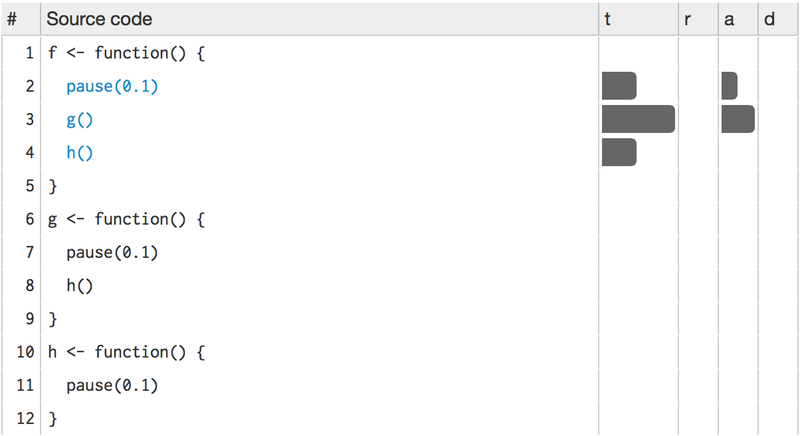 Here profiling-example.R contains the definition of f(), g(), and h(). Note that you must use source() to load the code. This is because lineprof uses srcrefs to match up the code to the profile, and the needed srcrefs are only created when you load code from disk. We then use lineprof() to run our function and capture the timing output. Printing this object shows some basic information. For now, we’ll just focus on the time column which estimates how long each line took to run and the ref column which tells us which line of code was run. The estimates aren’t perfect, but the ratios look about right. lineprof provides some functions to navigate through this data structure, but they’re a bit clumsy. Instead, we’ll start an interactive explorer using the shiny package. shine(l) will open a new web page (or if you’re using RStudio, a new pane) that shows your source code annotated with information about how long each line took to run. shine() starts a shiny app which “blocks” your R session. To exit, you’ll need to stop the process using escape or ctrl + c.
This technique should allow you to quickly identify the major bottlenecks in your code. Profiling does not extend to C code. You can see if your R code calls C/C++ code but not what functions are called inside of your C/C++ code. Unfortunately, tools for profiling compiled code are beyond the scope of this book (i.e., I have no idea how to do it). Similarly, you can’t see what’s going on inside primitive functions or byte code compiled code. If you’re doing a lot of functional programming with anonymous functions, it can be hard to figure out exactly which function is being called. The easiest way to work around this is to name your functions. Lazy evaluation means that arguments are often evaluated inside another function. For example, in the following code, profiling would make it seem like i() was called by j() because the argument isn’t evaluated until it’s needed by j(). If this is confusing, you can create temporary variables to force computation to happen earlier. A final technique is to rewrite in a faster language, like C++. That’s a big topic and is covered in Rcpp. Before we get into specific techniques, I’ll first describe a general strategy and organisational style that’s useful when working on performance. Writing faster but incorrect code. Writing code that you think is faster, but is actually no better. The strategy outlined below will help you avoid these pitfalls. I recommend that you keep a record of everything you try, even the failures. If a similar problem occurs in the future, it’ll be useful to see everything you’ve tried. To do this I often use R Markdown, which makes it easy to intermingle code with detailed comments and notes. Next, generate a representative test case. The case should be big enough to capture the essence of your problem but small enough that it takes only a few seconds to run. You don’t want it to take too long because you’ll need to run the test case many times to compare approaches. On the other hand, you don’t want the case to be too small because then results might not scale up to the real problem. Use this test case to quickly check that all variants return the same result. An easy way to do so is with stopifnot() and all.equal(). For real problems with fewer possible outputs, you may need more tests to make sure that an approach doesn’t accidentally return the correct answer. That’s unlikely for the mean. Finally, use the microbenchmark package to compare how long each variation takes to run. For bigger problems, reduce the times parameter so that it only takes a couple of seconds to run. Focus on the median time, and use the upper and lower quartiles to gauge the variability of the measurement. Before you start experimenting, you should have a target speed that defines when the bottleneck is no longer a problem. Setting such a goal is important because you don’t want to spend valuable time over-optimising your code. Has someone already solved the problem? CRAN task views. If there’s a CRAN task view related to your problem domain, it’s worth looking at the packages listed there. Reverse dependencies of Rcpp, as listed on its CRAN page. Since these packages use C++, it’s possible to find a solution to your bottleneck written in a higher performance language. Otherwise, the challenge is describing your bottleneck in a way that helps you find related problems and solutions. Knowing the name of the problem or its synonyms will make this search much easier. But because you don’t know what it’s called, it’s hard to search for it! By reading broadly about statistics and algorithms, you can build up your own knowledge base over time. Alternatively, ask others. Talk to your colleagues and brainstorm some possible names, then search on Google and stackoverflow. It’s often helpful to restrict your search to R related pages. For Google, try rseek. For stackoverflow, restrict your search by including the R tag, [R], in your search. As discussed above, record all solutions that you find, not just those that immediately appear to be faster. Some solutions might be initially slower, but because they are easier to optimise they end up being faster. You may also be able to combine the fastest parts from different approaches. If you’ve found a solution that’s fast enough, congratulations! If appropriate, you may want to share your solution with the R community. Otherwise, read on. What are faster alternatives to lm? Which are specifically designed to work with larger datasets? What package implements a version of match() that’s faster for repeated lookups? How much faster is it? List four functions (not just those in base R) that convert a string into a date time object. What are their strengths and weaknesses? How many different ways can you compute a 1d density estimate in R? Which packages provide the ability to compute a rolling mean? What are the alternatives to optim()? rowSums(), colSums(), rowMeans(), and colMeans() are faster than equivalent invocations that use apply() because they are vectorised (the topic of the next section). vapply() is faster than sapply() because it pre-specifies the output type. If you want to see if a vector contains a single value, any(x == 10) is much faster than 10 %in% x. This is because testing equality is simpler than testing inclusion in a set. Having this knowledge at your fingertips requires knowing that alternative functions exist: you need to have a good vocabulary. Start with the basics, and expand your vocab by regularly reading R code. Good places to read code are the R-help mailing list and stackoverflow. Some functions coerce their inputs into a specific type. If your input is not the right type, the function has to do extra work. Instead, look for a function that works with your data as it is, or consider changing the way you store your data. The most common example of this problem is using apply() on a data frame. apply() always turns its input into a matrix. Not only is this error prone (because a data frame is more general than a matrix), it is also slower. 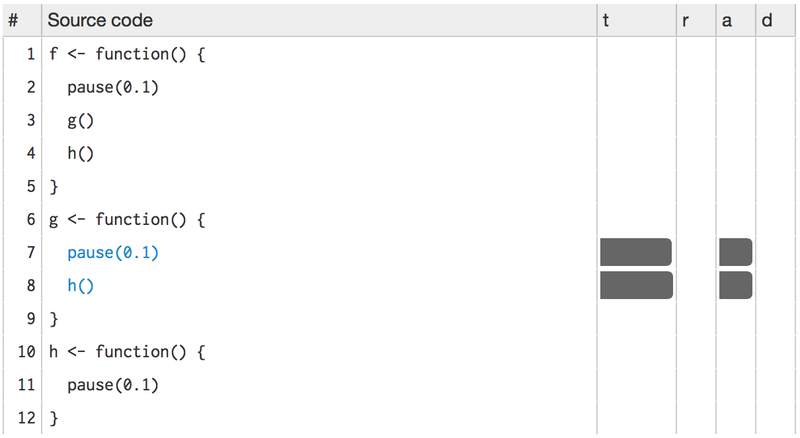 read.csv(): specify known column types with colClasses. factor(): specify known levels with levels. cut(): don’t generate labels with labels = FALSE if you don’t need them, or, even better, use findInterval() as mentioned in the “see also” section of the documentation. unlist(x, use.names = FALSE) is much faster than unlist(x). interaction(): if you only need combinations that exist in the data, use drop = TRUE. For S3, you can do this by calling generic.class() instead of generic(). For S4, you can do this by using getMethod() to find the method, saving it to a variable, and then calling that function. This optimisation is a little risky. While mean.default() is almost twice as fast, it’ll fail in surprising ways if x is not a numeric vector. You should only use it if you know for sure what x is. Knowing that you’re dealing with a specific type of input can be another way to write faster code. For example, as.data.frame() is quite slow because it coerces each element into a data frame and then rbind()s them together. If you have a named list with vectors of equal length, you can directly transform it into a data frame. In this case, if you’re able to make strong assumptions about your input, you can write a method that’s about 20x faster than the default. To come up with this minimal method, I carefully read through and then rewrote the source code for as.data.frame.list() and data.frame(). I made many small changes, each time checking that I hadn’t broken existing behaviour. After several hours work, I was able to isolate the minimal code shown above. This is a very useful technique. Most base R functions are written for flexibility and functionality, not performance. Thus, rewriting for your specific need can often yield substantial improvements. To do this, you’ll need to read the source code. It can be complex and confusing, but don’t give up! The following example shows a progressive simplification of the diff() function if you only want computing differences between adjacent values. At each step, I replace one argument with a specific case, and then check to see that the function still works. The initial function is long and complicated, but by restricting the arguments I not only make it around twice as fast, I also make it easier to understand. Next, I assume vector input. This allows me to remove the is.matrix() test and the method that uses matrix subsetting. Finally I assume lag = 1L. This eliminates input checking and simplifies subsetting. You’ll be able to make diff() even faster for this special case once you’ve read Rcpp. A final example of doing less work is to use simpler data structures. For example, when working with rows from a data frame, it’s often faster to work with row indices than data frames. For instance, if you wanted to compute a bootstrap estimate of the correlation between two columns in a data frame, there are two basic approaches: you can either work with the whole data frame or with the individual vectors. The following example shows that working with vectors is about twice as fast. How do the results change if you compare mean() and mean.default() on 10,000 observations, rather than on 100? The following code provides an alternative implementation of rowSums(). Why is it faster for this input? What’s the difference between rowSums() and .rowSums()? Make a faster version of chisq.test() that only computes the chi-square test statistic when the input is two numeric vectors with no missing values. You can try simplifying chisq.test() or by coding from the mathematical definition. Can you make a faster version of table() for the case of an input of two integer vectors with no missing values? Can you use it to speed up your chi-square test? Is there a way to vectorise this procedure? It makes many problems simpler. Instead of having to think about the components of a vector, you only think about entire vectors. The loops in a vectorised function are written in C instead of R. Loops in C are much faster because they have much less overhead. Functionals stressed the importance of vectorised code as a higher level abstraction. Vectorisation is also important for writing fast R code. This doesn’t mean simply using apply() or lapply(), or even Vectorise(). Those functions improve the interface of a function, but don’t fundamentally change performance. Using vectorisation for performance means finding the existing R function that is implemented in C and most closely applies to your problem. rowSums(), colSums(), rowMeans(), and colMeans(). These vectorised matrix functions will always be faster than using apply(). You can sometimes use these functions to build other vectorised functions. Vectorised subsetting can lead to big improvements in speed. Remember the techniques behind lookup tables (lookup tables) and matching and merging by hand (matching and merging by hand). Also remember that you can use subsetting assignment to replace multiple values in a single step. If x is a vector, matrix or data frame then x[is.na(x)] <- 0 will replace all missing values with 0. If you’re extracting or replacing values in scattered locations in a matrix or data frame, subset with an integer matrix. See matrix subsetting for more details. If you’re converting continuous values to categorical make sure you know how to use cut() and findInterval(). Be aware of vectorised functions like cumsum() and diff(). Matrix algebra is a general example of vectorisation. There loops are executed by highly tuned external libraries like BLAS. If you can figure out a way to use matrix algebra to solve your problem, you’ll often get a very fast solution. The ability to solve problems with matrix algebra is a product of experience. While this skill is something you’ll develop over time, a good place to start is to ask people with experience in your domain. The downside of vectorisation is that it makes it harder to predict how operations will scale. The following example measures how long it takes to use character subsetting to lookup 1, 10, and 100 elements from a list. You might expect that looking up 10 elements would take 10x as long as looking up 1, and that looking up 100 elements would take 10x longer again. In fact, the following example shows that it only takes about 9 times longer to look up 100 elements than it does to look up 1. Vectorisation won’t solve every problem, and rather than torturing an existing algorithm into one that uses a vectorised approach, you’re often better off writing your own vectorised function in C++. You’ll learn how to do so in Rcpp. The density functions, e.g., dnorm(), have a common interface. Which arguments are vectorised over? What does rnorm(10, mean = 10:1) do? Compare the speed of apply(x, 1, sum) with rowSums(x) for varying sizes of x. How can you use crossprod() to compute a weighted sum? How much faster is it than the naive sum(x * w)? A pernicious source of slow R code is growing an object with a loop. Whenever you use c(), append(), cbind(), rbind(), or paste() to create a bigger object, R must first allocate space for the new object and then copy the old object to its new home. If you’re repeating this many times, like in a for loop, this can be quite expensive. You’ve entered Circle 2 of the “R inferno”. Here’s a little example that shows the problem. We first generate some random strings, and then combine them either iteratively with a loop using collapse(), or in a single pass using paste(). Note that the performance of collapse() gets relatively worse as the number of strings grows: combining 100 strings takes almost 30 times longer than combining 10 strings. Modifying an object in a loop, e.g., x[i] <- y, can also create a copy, depending on the class of x. Modification in place discusses this issue in more depth and gives you some tools to determine when you’re making copies. R 2.13.0 introduced a byte code compiler which can increase the speed of some code. Using the compiler is an easy way to get improvements in speed. Even if it doesn’t work well for your function, you won’t have invested a lot of time in the effort. The following example shows the pure R version of lapply() from functionals. Compiling it gives a considerable speedup, although it’s still not quite as fast as the C version provided by base R.
Byte code compilation really helps here, but in most cases you’re more likely to get a 5-10% improvement. All base R functions are byte code compiled by default. The following case study shows how to make t-tests faster using some of the techniques described above. It’s based on an example in “Computing thousands of test statistics simultaneously in R” by Holger Schwender and Tina Müller. I thoroughly recommend reading the paper in full to see the same idea applied to other tests. For data in this form, there are two ways to use t.test(). We can either use the formula interface or provide two vectors, one for each group. Timing reveals that the formula interface is considerably slower. How can we make this faster? First, we could try doing less work. If you look at the source code of stats:::t.test.default(), you’ll see that it does a lot more than just compute the t-statistic. It also computes the p-value and formats the output for printing. We can try to make our code faster by stripping out those pieces. This gives us about a 6x speed improvement. Now that we have a fairly simple function, we can make it faster still by vectorising it. 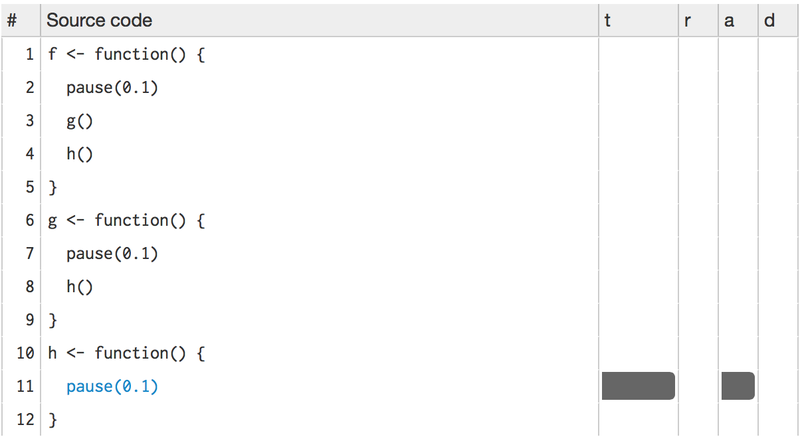 Instead of looping over the array outside the function, we will modify t_stat() to work with a matrix of values. Thus, mean() becomes rowMeans(), length() becomes ncol(), and sum() becomes rowSums(). The rest of the code stays the same. That’s much faster! It’s at least 40x faster than our previous effort, and around 1000x faster than where we started. In this example, byte code compilation doesn’t help at all. Parallel R by Q. Ethan McCallum and Stephen Weston. Parallel Computing for Data Science by Norm Matloff. What I want to show is a simple application of parallel computing to what are called “embarrassingly parallel problems”. An embarrassingly parallel problem is one that’s made up of many simple problems that can be solved independently. A great example of this is lapply() because it operates on each element independently of the others. It’s very easy to parallelise lapply() on Linux and the Mac because you simply substitute mclapply() for lapply(). The following code snippet runs a trivial (but slow) function on all cores of your computer. The main difference between mclapply() and makePSOCKcluster() is that the individual processes generated by mclapply() inherit from the current process, while those generated by makePSOCKcluster() start with a fresh session. This means that most real code will need some setup. Use clusterEvalQ() to run arbitrary code on each cluster and load needed packages, and clusterExport() to copy objects in the current session to the remote sessions. There is some communication overhead with parallel computing. If the subproblems are very small, then parallelisation might hurt rather than help. It’s also possible to distribute computation over a network of computers (not just the cores on your local computer) but that’s beyond the scope of this book, because it gets increasingly complicated to balance computation and communication costs. A good place to start for more information is the high performance computing CRAN task view. Read R blogs to see what performance problems other people have struggled with, and how they have made their code faster. Read other R programming books, like Norm Matloff’s The Art of R Programming or Patrick Burns’ R Inferno to learn about common traps. Take an algorithms and data structure course to learn some well known ways of tackling certain classes of problems. I have heard good things about Princeton’s Algorithms course offered on Coursera. Read general books about optimisation like Mature optimisation by Carlos Bueno, or the Pragmatic Programmer by Andrew Hunt and David Thomas. You can also reach out to the community for help. Stackoverflow can be a useful resource. You’ll need to put some effort into creating an easily digestible example that also captures the salient features of your problem. If your example is too complex, few people will have the time and motivation to attempt a solution. If it’s too simple, you’ll get answers that solve the toy problem but not the real problem. If you also try to answer questions on stackoverflow, you’ll quickly get a feel for what makes a good question.